Wow is this write-up well overdue! When I traveled to Los Angeles for the Xotics Battle this past January, I knew there was one stop in Hollywood I absolutely had to make. Mr. Nail Lounge is prominently located at 9005 Melrose Avenue but the details don't stop with the zip code. Naturally I had to sit down with the leading lady, Maston, who is behind every good looking pair of hands in and near Tinseltown. She welcomed me with open arms all the way from Manhattan to check out what West Hollywood has to offer. It's no secret that I believe in elevating our industry and how people perceive barbers but this takes it to another level! 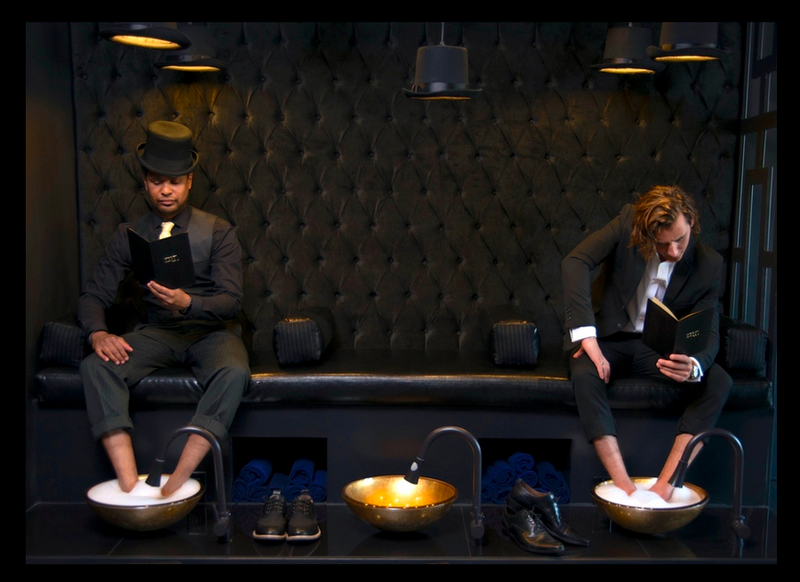 Check out some details on this amazing lounge for men from haircuts to pedicures and let me know what you think of this trend picking up! When you think of a business owner behind a men's nail salon, you assume they must have been immersed in the industry from a young age. This is not the case with Maston nor her mother, Nana, who is her business partner and it was a complete surprise to me. Okay, I know you want to know, she was in Dental school. Yeah, I was shocked too. Better yet, the idea came to Maston as she was considering what she wanted to do after school and realized this niche industry was extremely underserved in Hollywood. 'Too many guys have to go to regular nail salons and deal with the chemicals, chatter and awkward looks', Maston told me. She wanted to create an environment that allowed men to indulge while relaxing whether that means watching the flat screen, having a cocktail or a shave. Upon walking in to Mr. Nail Lounge, your world is completely transformed from the rainy L.A. day to deep, black walls, ornate gold fixtures and large leather chairs. Even the small things were thought about too: menus for both your drinks and your services were individually done, bronze tubs for your feet to be pampered in, and of course, a barber station. When I visited it wasn't even open for a full year and business was already booming. Upon asking her what she envisions for the future of men's nails and her business, Maston confidently replied that they plan on opening one in Orange County, California and, hopefully, New York City too. I know plenty of guys who would love this (and some who need it), do you? Check out the gallery below, your mind will be blown if it hasn't already. One Product That'll Make Your Hair Do ANYTHING. Last week we celebrated our One Month and one of the things I mentioned was how this site exists because of you all. Whether you're a Barber, Stylist, or a guy trying to figure out his hair, you all create this community that I'm continuously working hard to build. With that being said, I've received a request! And no, it's not from anyone in the hairstyling community but from guys who have been reading this. They want to know about Leave In Conditioner because they honestly know nothing about this product. All these options, how is anyone supposed to figure out what goop to stick in their hair? One good trick to remember is that it should not feel goopy. Just sayin'. I've compiled three of my favorite leave in conditioners with the following guidelines: Access, Compatibility (with hair types), Design, and Price. 1) B for Men, Bed Head by TIGI, $12 is a great option for leave-in conditioner. They're easy to find in Harmon's, on Amazon or their own site while offering a great price that appeals to men. I do find that they're conditioner can lean on the heavy side due to it being a cream so use sparingly. Overall, I give a 7/8 taking one of two points for Compatibility. 2) BB Leave In (Rinse Out) Conditioner, Bumble and Bumble, $26 may just be a cult favorite for many stylists. Bumble is known for their professional quality line for personal use prices. To guys $26 may seem like a lot of money for a leave-in conditioner but what I love about this one is it can be used as both rinse out or leave-in. I always recommend to my clients to condition in the shower when they wash their hair (at least twice a week) but to also use a leave in conditioner if their hair is coarse or hard to style. Bumble is really easy to get your hands on and I don't find their formula too heavy given it's acts as both kinds of conditioner. Definitely an 8/8 overall. 3) 7 Seconds Conditioner, Unite, offers my personal favorite leave-in conditioner. It's a spray making it hard to grease up your hair and they offer it for sale on the site (2 oz for $10 or 8 oz for $26.25) or give you a system to find a salon nearby. What I recommend for my guys is to buy both sizes so they have the big one at home but the smaller one for when they shower at the gym. This can be used daily or only a couple of times a week depending on how dry or coarse your hair is. 8/8 in my book for Unite! Barbers and Stylists, do you use leave in conditioner on your guys? What are some of your favorites? Guys! I've already heard from some of you and now want to hear from the rest, do you use Leave-In Conditioner? Has it worked for you? If not, what did you not like about it? Looking forward to your comments below or as always use the Contact page and send an e-mail! Battle of the Beard: Part 2! Last Monday we talked about ways to keep your clients' summer beards ready for this Summer heat and we've been asked 'Now what?'. I've carefully curated beard care items that in my personal experience have worked best for my clients. Some of you may have other brands that are your go-to, great! I want to hear all about them and try them out for myself because if you use them on your clients or yourself everyday then it's probably super. Using anything on your face is a very personal thing and requires some knowledge of skin care. Let's review Beard Facts from last week's Battle of the Beard: Part 1. In my quest to find and use the best beard products possible I have come up with four distinctly different products to suit (hopefully) everyone's taste. This company has been around FOREVER...and when I say that I'm not exaggerating. These guys know what they're doing and it shows. This product is great for multiple uses including moisturizing the skin UNDER your beard while giving a nice healthy shine to the many hairs on your face. You can also use it to slick your hair like in Mad Men. Most guys already catch food in their beard. So why not have something that smells great and cleans your beard? Definitely makes sense to me. This awesome shampoo softens the beard hairs in the process too so your lover doesn't want to smack you for a rash on their face. And here they are again, ladies and gentlemen! We've mentioned Brooklyn Grooming quite a few times in previous articles and 'why?' you ask? Because we love them! This fun kit offers FOUR different scents. Definitely makes sense to have 'Commando' on hand for daytime and 'Williamsburg' or 'Red Hook' to really impress your date while 'Forte Greene' will make your boss promote you on the spot! We came across these guys on Instagram and absolutely love their products. Everything is natural and there are NO chemical fillers in these products. What we love most about this combo is it has the Cedarwood that we adore from BG but a cool twist of mint. Refreshing! You can also use this duo for different days that you find yourself in need of an oil AND wax. Let us know what you think in the comments below! Have you tried any of these before? What are your favorite go to beard products for your clients? Guys, have you given beard oil or waxes a shot yet? Sound off below! As always, check back Mondays and Thursdays 11AM EST for fun products, tips and lady barbers! Happy Monday ladies and gentlemen, until next time! Last week, I mentioned a small but strong company named Whip Hand Cosmetics in Shaving on Set!. So far, I have received tremendous feedback requesting more information on them and thought I'd properly introduce them like I had introduced Brooklyn Grooming earlier this month. Who's the mastermind behind Whip Hand? Better yet, how did they come up with fantastic products that are geared towards both men and women without scaring either off? I'd love to tell you right now. Although primarily geared towards Makeup Artists, Whip Hand has become a strong force in the men's grooming arena. Products ranging from 'Give Good Face' Rosewater Tonic to 'Strike It Rich' Deep Cleansing Oil allow men to take care of their skin without feeling out of place. Most companies do not consider both men and women, but every detail ranging from the bold colors to the strong text suggest that Whip Hand has carefully curated a line that is open to any one. Fun fact: the company was founded only 3 years ago in 2011 and launched May 2012! In a few short years they have taken strides to establish themselves as a go to for professionals and consumers alike. I briefly introduced Riese Lauriat in Shaving On Set! but feel she deserves a larger round of applause for her hard work and devotion to this company. A veteren professional makeup artist and esthetician, Riese has more than 15 years of experience in the beauty industry. While Riese loves the creativity of producing beautiful, useable makeup, she will say that her real reason for starting Whip Hand Cosmetics was to open up opportunities for other men and women in the field and to create jobs in Detroit. Riese Lauriat, founder of Whip Hand Cosmetics, working on set behind the scenes. Although in it's infancy, Whip Hand Cosmetics has already been present at large name events and used on awesome celebrities. As I've mentioned, I use it on set all of the time for when I need to do a quick shave or need to ensure the minimal makeup I apply on a male model stays in crazy temperatures. Rashida Bishop, a professional men's groomer, even used it on Patrick Stewart for one of her shoots! They've been featured in Women's Wear Daily, The Huffington Post, Cosmopolitan, Allure Magazine and have sponsored Mercedes Benz Fashion Week Swim in Miami, phew! I can see Riese is keeping her tight knit company busy and it's certainly paying off. "All of Whip Hand Cosmetics professional makeup artist-quality cosmetics and skin care products are developed and manufactured in Metro-Detroit in small lots, by hand. While this process is more labor-intensive, it allows us to create unique products of exceptional-quality that stand-up to the demands of pros, while also delighting makeup lovers of all colors and walks of life." Hmm...I'm starting to notice a correlation between companies I love for their quality and this trend of developing their products by hand (cough, Brooklyn Grooming). I can't wait to continue updating you all on their fabulous products and their versatile uses in the shop as well as on set! Have you used Whip Hand Cosmetics before? Tell us in the comments or e-mail us with your feedback, we'd love to hear! Check back every Monday and Thursday 11:00 AM EST for product reviews, how to's and introductions to our favorite companies. Feel free to submit a product or company that you feel has impacted the men's grooming and barber game! Two weeks ago I had FOUR men's editorials, most on location and all of them requiring the models to shave. All of my barbers whether ladies or gentlemen know that a shave in the shop is fun! You have pre-shave oils, hot lather, maybe a steamer and nice hot or cold towels...oh, and a proper chair. Many of my fellow freelancers can agree that shaving is the last thing you want to take care of on set. Aside from time constrictions, people running around constantly asking for ETA to set, and lack of a proper chair, we dread having a model who isn't freshly shaved. Sure, some clients don't mind scruff, but for those who do, it puts a real damper on the makeup application. I treat men shaving on set just like my female clients having their eyebrows waxed or threaded while preparing for a shoot or special occasion. If you do it too close to the day of the skin will not allow makeup to adhere thus not allowing the artist to cover any redness or flaws. It is a real pain! But I have figured out two small, simple but super helpful solutions that can be applied to shaving whether on set or in a rush. Taking a few drops of your drugstore Glycerine and adding it to your shaving cream will help create a barrier on the skin. What most people fail to realize is that when you shave you're not only removing hair but a layer of skin as well which causes inflammation and redness. This is why pre-shave and after shave oils are so important but when you're in a pinch on set this will be a life saver! By creating a thin layer, it protects the skin and allows the Makeup Artist to apply anything on the skin with ease. It also helps male models or male clients who are 'dry shaving' on set prevent breakouts after. I will note that if you have sensitive skin or are treating your skin with any medication, to please take this tip with a grain of salt, I am not a dermatologist and cannot specify who this will work for. While your handy Glycerine helps protect the skin while shaving, you should still continue after as well. Although I haven't had the opportunity to discuss Whiphand Cosmetics on Her Chair His Hair yet, I felt that this product was a must to mention! Riese Lauriat has developed a whole line for makeup artists that I have used since day one, it is a staple for sure. Give Good Face is a rosewater toner that can be used before makeup application as well as after to refresh skin that may dry. So why mention it for shaving? Rosewater is known to reduce redness and naturally balance the skin which most men don't realize they need after using their handy razor. Aside from it helping out your client's skin, Whiphand developed a handy 1 ounce bottle for all your travel needs that can be refilled from their larger size bottle. A definite must have in my kit and all of the guys love how it smells! I want to hear what your go-to products are for shaving on the go or on set! Lady Barbers, Makeup Artists, Men's Groomers, what do you prefer to use? If you give our two products a try, let us know what you think and if it helped at all! Check back on Thursday at 11:00 AM EST for more reviews, helpful tips and our feature on Chase Monroe, Lady Barber extraordinaire!